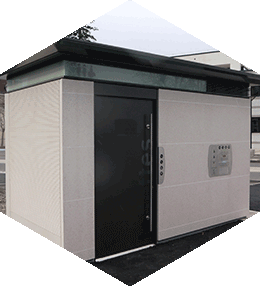 Currently in use in many public spaces, single-cabin toilets meet the requirements and needs of all users. All our models have been designed for optimum user comfort and to reduce maintenance costs for local authorities. As such, all our cabins are accessible to persons with reduced mobility (PRM). Special emphasis is placed on cabin hygiene and cleanliness while ensuring that users are safe. Three levels of cleaning are offered to meet all needs: Manual, Self-cleaning, Saninew ® Self-cleaning Plus. Our single-cabin toilets are designed to be long-lasting and are very strong and durable. 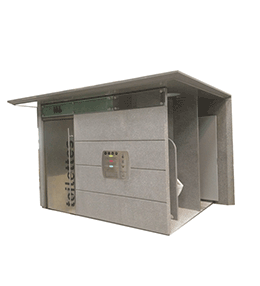 They are designed to reduce operating and maintenance costs as far as is possible. Using carefully thought-out contemporary designs, they can also be customised to adapt them to specific demands. In order to comply with the various requirements, Francioli offer a range of options for certain cabins. To find out more about the basic and optional equipment available for the selected item, click on the “EQUIPMENT” and “OPTION” tabs at the bottom of the product page. In order for each cabin to integrate perfectly into each space, Francioli offers a large selection of indoor and outdoor environments. To find out more about the basic and optional equipment available for the selected item, click on the “OUTDOOR ENVIRONMENTS” and “INDOOR ENVIRONMENTS” tabs at the bottom of the product page.